UC San Diego Chancellor Pradeep K. Khosla and Thomas Csordas, director of the Global Health Program in the Division of Social Sciences, opened the UC showcase of change-making work in global health. “There are more mental health professionals in New York City than the whole continent of Africa.” That wasn’t the start of a bad joke at the Big Apple’s expense. 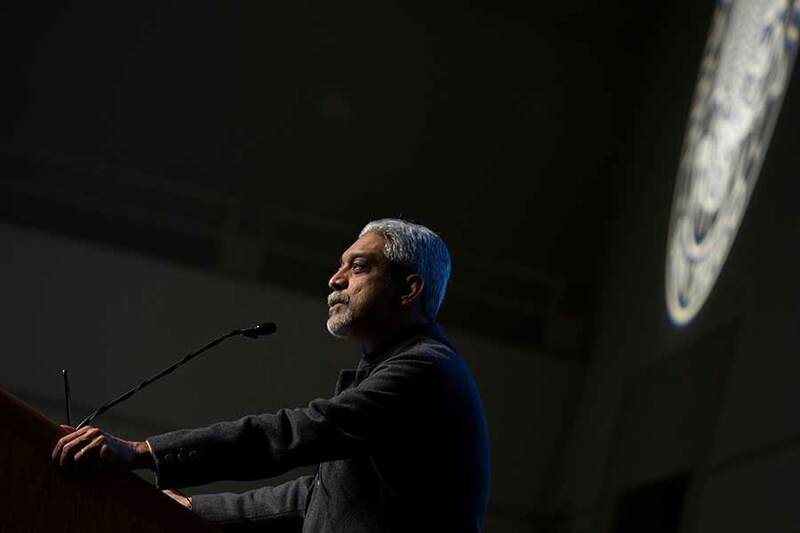 Rather, it was a troubling statistic delivered by internationally renowned psychiatrist Vikram Patel in an inspiring, solutions-oriented keynote address at UC Global Health Day on April 22. Held this year at UC San Diego on the theme of “Committing to a Healthier World,” UC Global Health Day is a system-wide conference organized by the UC Global Health Institute. 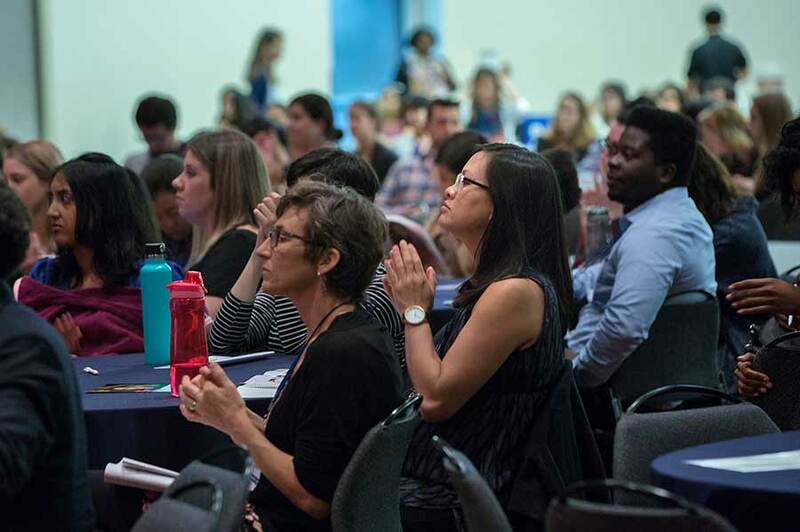 It showcases the outstanding research, training and outreach on global health taking place throughout the University of California and brings together faculty and students from a variety of disciplines to share and grow their change-making work. 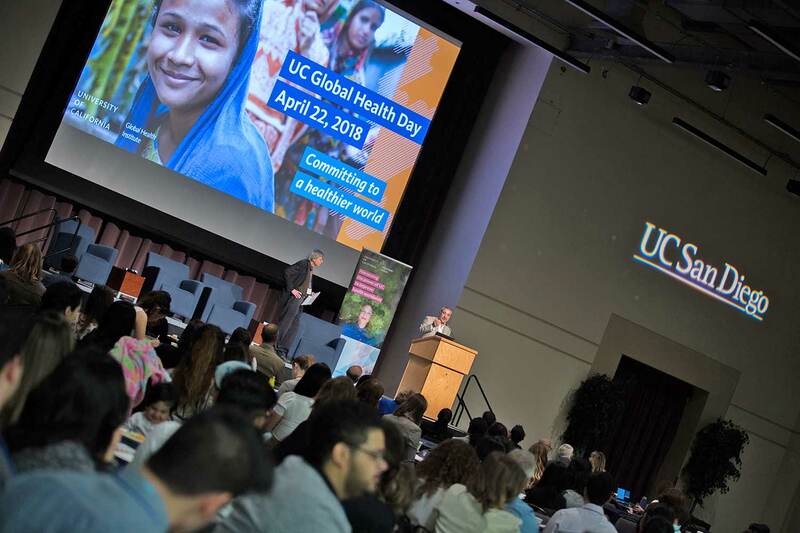 The sixth and most successful event of its ilk yet, UC Global Health Day 2018 drew more than 500 participants to UC San Diego. All of the UC campuses were represented at the daylong gathering. Keynote speaker Vikram Patel: We’ve got to make mental health a human rights issue. The event was opened by UC San Diego Chancellor Pradeep K. Khosla and Thomas Csordas, professor of anthropology and director of the Global Health Program in the UC San Diego Division of Social Sciences, who served as chair of the planning committee for UC Global Health Day. Tom Coates, director of the UC Global Health Institute, welcomed keynote speaker Patel to the stage. Patel, who was dubbed a “well-being warrior” by TIME magazine in its 2015 list of the world’s 100 most influential people, is a champion for closing the treatment gap for mental disorders in low-resource countries. His talk at UC San Diego called for universal mental health coverage around the world, including in the United States. Psychological pain and suffering is a universal human experience, said Patel, who is now at Harvard Medical School’s department of global health and social medicine. Also universal, he said, is the influence of social class barriers on access to quality care. In the last 25 years or so, the burden of mental disorders—from autism in childhood to depression and psychosis in adulthood and dementia in old age—has risen precipitously, increasing globally by 40 percent. In the lowest income countries, it has almost doubled. The treatment gap in poorer nations is larger than that in the higher income countries, but that isn’t to say that the latter do a great job delivering care. In the U.S., Patel said, there are more than 400,000 people with serious mental disorders currently living in federal prisons. We live in a country with such incredible resources, but people are not getting the care they need. What do we need to do to change things? Science is great, he said, but it’s not going to fix this. Global health practitioners must “step out of the universities and engage communities,” engaging in particular those who are affected and young people to demand change. Patel talked a lot about solutions, including solutions like those implemented by the non-governmental, nonprofit organization he co-founded in India, Sangath, whose focus is on empowering ordinary people and community health workers to deliver mental health care. More than 500 people, from all the UCs and beyond, participated in UC Global Health Day 2018. “The moral imperative for mental health and sustainable development,” Patel said, “is to leave no one behind—by implementing evidence-based, community-delivered care for treatment and prevention of mental disorders, embedded in a universal health coverage and empowerment framework.” We’ve got to make mental health a human rights issue, he said. Responding to Patel’s keynote were Janis Jenkins, UC San Diego professor of anthropology and psychiatry, who recently launched the Center for Global Mental Health at UC San Diego, and Bruce Link, distinguished professor of public policy and sociology at UC Riverside. Jenkins said that the time is indeed right for mental health to be an international priority. She addressed the ways problems are culturally conceptualized and socially responded to, which affects care outcomes. Link spoke about structural stigma and institutionalized racism, and he put an emphasis on what he called “the essences needed to push positive change”: creativity, rigor and heart. The keynote address and commentaries were followed by a panel on the UC Global Health Institute’s Advocacy Initiative. Titled “Catalyzing Student Advocacy into Action,” the panel featured UC efforts to convey policy-relevant research to legislators and featured student presentations on letter-writing campaigns and community outreach, as well as the art of penning impactful op-eds. Participants in the afternoon’s plenary session—“Refugee and Immigrant Health: From Research to Policy and Practice”—also urged turning scholarship into action. Throughout the day, there were 18 breakout sessions, ranging from such topics as growing food in the face of a changing climate and teaching the ethics of global health to building health justice in underserved communities and exploring improvements to the United Nations’ 2030 Sustainable Development Goals. 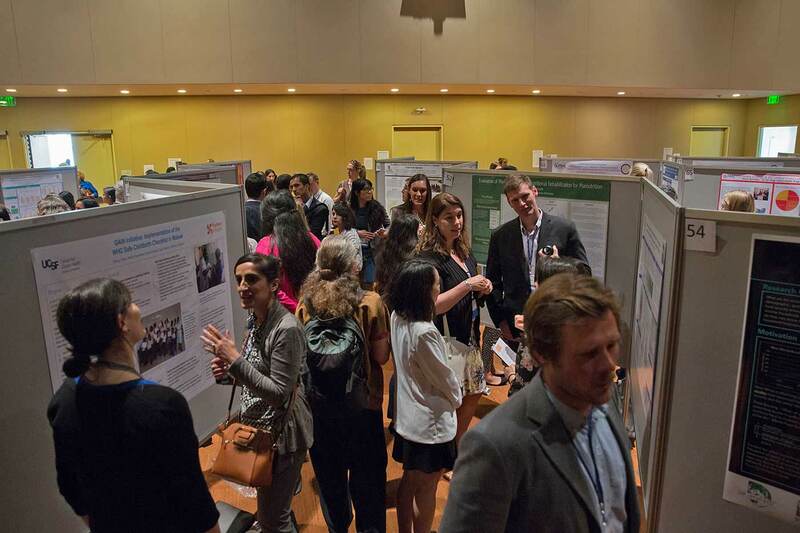 Research posters helped drive the daylong discussion of global health concerns and ideas for solutions. A Career and Field Experience Expo highlighted opportunities for students to get hands-on experience and pursue post-graduate education and careers in global health. There was a research poster session, too, with more than 120 participants, including students from the Global Health Program at UC San Diego presenting their senior capstone projects. Closing out the day was a dance performance by the student group Movement Exchange at UC San Diego, a local chapter of an international organization that unites dance and service to make a change. Vanessa Gibeson and Brittany Wright contributed to this report.